Compared to earlier versions of the 2.0-liter Ecotec turbo, GM powertrain engineers have significantly upgraded the new engine with turbo power and direct fuel injection to accommodate E85 fuel and to incorporate refinements. Aside from the direct injection, which most other companies have, the basic component set that makes up the Buick Regal's 2.0L success with variable fuel mixes includes a fuel rail and injectors, a high pressure cam-driven fuel pump and the important E39 engine control module containing the “Viper” 32 bit microprocessor. 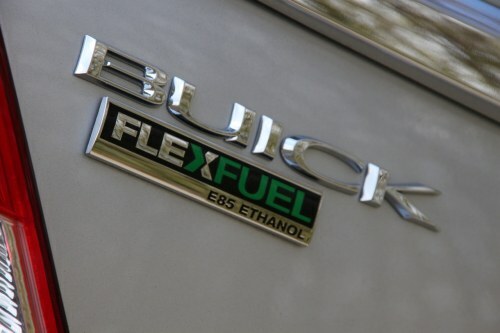 That level of sensing and metering now allows the 2011 Buick Regal Turbo to join more than 5 million flex-fuel models General Motors which has produced over the last 15 years. According to the GM news release out of Pontiac, Michigan, the turbocharged Ecotec 2.0-liter inline four-cylinder engine that powers the Regal will help GM reach its goal of offering more than 50 percent of its production in flex-fuel models by the end of 2012. For the record, ethanol requires a richer air-fuel mixture than gasoline; meaning flex-fuel engines need higher flow-rate injectors. Problem is, a flex-fuel engine can potentially have any combination of gasoline or up to 85 percent ethanol in the tank at a given time, so a sensor in the fuel system is required to measures the blend in real-time. According to GM, this allows the engine management system to automatically adjust the mixture to provide improved performance and reduced emissions and fuel consumption. Stainless steel fuel lines already provide extra corrosion resistance to ensure that the Regal Turbo meets GM’s stringent durability requirements. Fact is, Ford is already using turbos extensively on their EcoBoost engines. Obviously, they must have some kind of discerning sensor. For the record, turbochargers use the energy in the hot exhaust gas flow to drive a compressor that forces more air into the combustion chamber for on-demand power delivery. The twin-scroll turbocharger on the GM Ecotec engine, for example, provides two inlet paths to the turbine to maximize the kinetic and thermal energy delivered to the turbine. The twin-scroll turbocharger eliminates lag, as it helps the engine generate power and torque when the driver needs it for passing maneuvers or merging onto a highway even at low engine speeds. While the 2.0-liter Ecotec turbo produces 258 pound-feet of torque from 2,000 to 5,500 rpm, it feels more powerful, like a much-larger V6 engine while still delivering four-cylinder efficiency. Other changes to the turbo engine for 2011 go well beyond the addition of flex-fuel capability. The 2.0-liter Ecotec turbo, for example, has a new precision sand cast aluminum cylinder block that provides better durability while transmitting less noise and vibration than lost foam casting used previously. For the record, the lost foam casting process dates back to the original Saturn engines. The end result is a quieter and more refined power plant that helps the Regal achieve best-in-class levels of noise, vibration and harshness. Performance is expected to be among the best of the import sport sedans, plus the ability to operate on current and next-generation renewable biofuels.